On the weekend, I attended the Architecture Foundation Conference at Milsons Island on the Hawkesbury River in New South Wales. The conference is convened by Lindsay and Su Johnston and each year they do a brilliant job in running an inspiring event for the architectural profession. 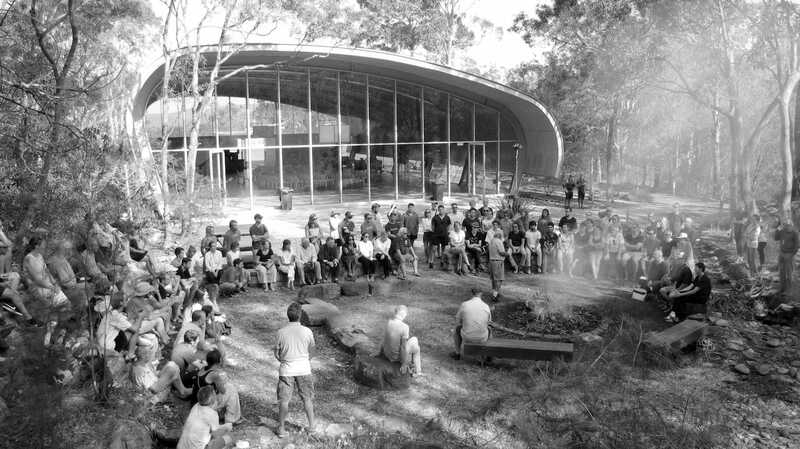 The conference is called “Deerubbin” which is the Aboriginal name for the Hawkesbury River and it means deep and wide river. The conference featured many local and international architectural speakers that challenged and inspired my approach to design. The conference was built around the theme of Density and Community and it was highly relevant to what is happening to our cities – especially Sydney and Melbourne. I chose to travel by train to and from the conference – a 12-hour train trip from Melbourne to Sydney that would take me halfway around the world had I chosen to fly. I wanted time to think about where I was going and time after the event to think about the things I learned. Before the conference started we participated in a traditional Welcome to Country ceremony which was accompanied by a smoking ceremony performed by Uncle Max. Uncle Max ‘Dulumunmun’ Harrison is a community elder of his native Yuin country. We came together as a group in a clearing around a fire and we were greeted with lots of smoke and the smell of eucalyptus filled our lungs. We all gathered to hear Uncle Max speak to us. However, I must admit I never really appreciated Welcome to Country ceremonies. I have always respected the tradition – but I never fully appreciated the significance. I never truly felt the meaning or significance behind the ceremony. There were lots of things Uncle Max said that made me reflect. The elements that I remember clearly were that he explained the importance of journey, of being respectful of place and acknowledging that we are coming to someone else’s home. When we enter another person’s house – we respect the invitation and we do this naturally. We acknowledge our host’s invitation, we are respectful and we are made to feel welcomed into someone else’s home by being polite and respectful. Uncle Max’s made us feel welcomed by inviting us to participate in the Welcome to Country ceremony. He spoke about the spoken language and how words are just sounds that we interpret. We place considerable importance on spoken words – but really, they are noises and sounds to which we attach meaning. He explained that nature also has a language – the sound of the wind, trees, animals and the water are all voices that we can listen to and interpret. Nature – he explained – talks to us, we can learn valuable lessons if we are willing to listen and if we are willing to use our eyes. When Uncle Max talked about ‘this thing called climate change” my heart sank. However, he explained that architects can make a change to how we live and how we impact our environment. He pointed to the landscape behind us and explained that nature can be our teacher. After the ceremony, we had a meal and the conference began and ran over 2 intensive days. Each speaker showed image after image on a giant screen. We were given a breath-taking ride through many ideas, images and thoughts that provoked and prodded at the way we work and do architecture. Without any disrespect to any of the brilliant speakers it was Uncle Max who captured my attention and made me think about our approach. He did not use a screen and a collection of images – he pointed to the trees that were right there, to the sky that was immediately overhead and the river beyond. He was able to show us that everything we need to learn is right here and a good time to start is right now. The last speaker at the conference was Adam Haddow from SJB Architects – he made the observation that he looked forward to the day when we didn’t own property – but rather that we see ourselves as the custodians of the land. It is terrible what has happened to a proud nation and I better understand that reconciliation with our first people will make a real difference for all Australians. The Welcome to Country ceremony is their way to say welcome and we can acknowledge that welcoming by being respectful that we are living and working in their home. By better integrating our work into the urban and natural landscape we respect the place we all share and enjoy.